Genius reveals the SP-i400, a portable music player speaker that plays music from SD cards or external devices via a 3.5mm jack. It will be available in retail stores for $24.90. Genius, a leading manufacturer of computer peripherals, is pleased to announce that their SP-i400 Portable-Music-Player Speaker is now available for purchase in the USA and Canada. Small and compact, the SP-i400 outputs 2 watts (RMS) of sound and is the perfect device for playing music on-the-go because of its FAT32 format and support of Mp3 and WMA file types. The SP-i400 is available in two colors, fashion metallic or elegant purple, and operation is simple. Just insert your SD card (up to 32GB), or use the built-in 3.5mm jack to connect it to your iPad, iPod, mobile phone, computer, or Mp3/Mp4 player and start enjoying great sound-quality with the SP-i400. After their SP-i300 Portable Speaker received lots of attention from international buyers at Computex 2011, Genius decided to up their game with the SP-i400. With a built-in, rechargeable lithium battery, the SP-i400 can operate for up to eight hours before needing a charge. Then its just a quick and simple USB charge and the SP-i400 is ready to go again. In addition to play/pause, next track/forward, back track/reverse, and volume control buttons, users can also save battery by using the included on/off switch. The SP-i400 is magnetic and compact so it can be moved about and easily secured to metal objects. 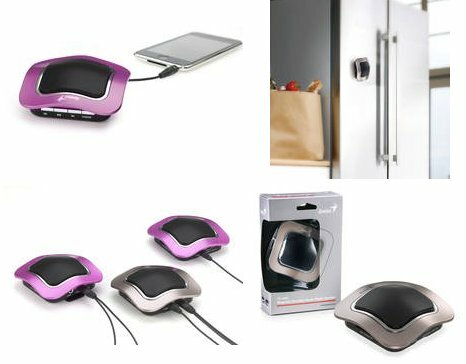 Additionally, Genius has given the SP-i400 a Stick-N-Go mount so not only does it easily connect to metallic surfaces, but also to walls, notebook computers, and pretty much any other surface you can think of. One of the best features of the SP-i400 Portable-Music-Player Speaker is its ability to communicate with other Genius speakers using the Genius-Link function. When 2 watts just isn't enough, users can line up a row of these portable speakers and sync them all together with the Genius-Link function.